Experiencing Saturday qualifying at Monza is a joy any F1 fan will relish. But 1998's reaction by the fanatic tifosi to Michael Schumacher's pole-winning effort was nothing compared to the reception Mario Andretti received when, in his last-but-one Grand Prix, he stole pole for the Prancing Horse in the dying minutes of the session. It had been a tough season for the Scuderia, for in a year in which they undoubtedly had the best car in the field, the Drivers Championship which would have been rightfully theirs was taken away by dramatic practice crashes. 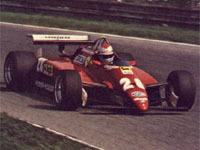 In the first Gilles Villeneuve was lost to the world, after the second Didier Pironi would never return to an F1 cockpit again. What started off the team's bad karma was the acrimony of Pironi ignoring team orders at the FOCA-boycotted Imola race. Villeneuve was furious with the Frenchman's behaviour, believing it was his turn to become World Champion after having given way to Jody Scheckter in 1979. Gilles' fury hadn't ceased when the circus reached Zolder. Pironi then looked likely to coast to a sad World Championship, only to slam into the back of Alain Prost's Renault, which went totally unsighted in a rain-soaked practice session for the German GP.